Here's the Danish Le Mans contingent, in Copenhagen today - at the Danish Automobile Sports Union (to meet the Danish press). Do you recognise them all? 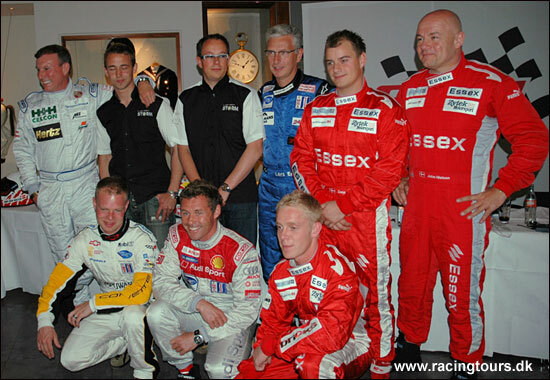 In the back row we have Thorkild Thyrring, Nicolas Kiesa, Jens Moller, Lars Erik Nielsen, Casper Elgaard and John Nielsen, and in the front Jan Magnussen, Tom Kristensen and Philip Andersen. Currently their win total stands at ten: how many will it be by 17.00 on June 18? Image provided by Henrik Vejgaard.